I was thinking of having students use technology more this coming school year. I have 3 laptops in my office along with my ipad. I know that's not a lot of computers, but it's more than I had last year. 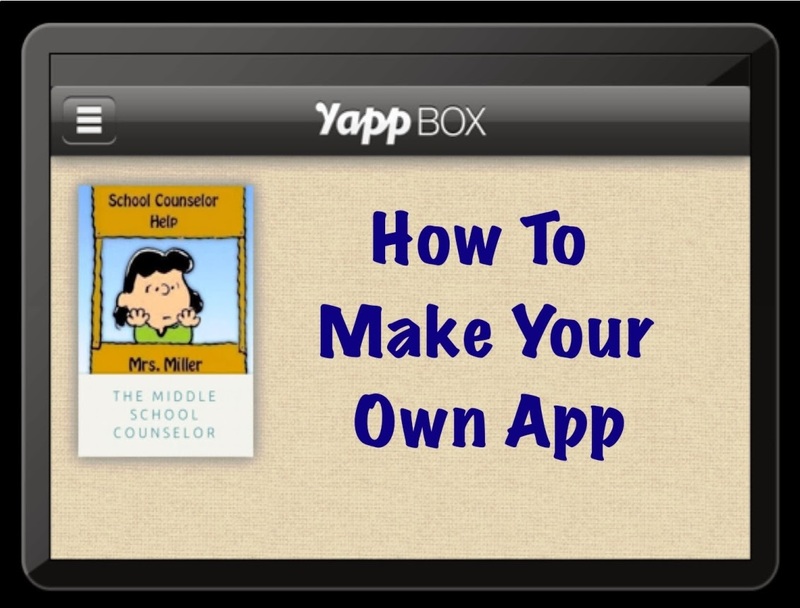 The idea of having them create an app was appealing as I thought about some of the lessons we do on kindness or on study skills and career research. I decided to take this idea for a test drive and start with an app for this blog. I tried using the app creator, apps bar.com, but could not get past the first page. I looked online for other app creators and Yapp looked pretty easy. It is primarily used for events, but you can tweak the pages as you would like. Here are a few screen shots so you have an idea what it looks like. 1. Choose a cover from their selections. 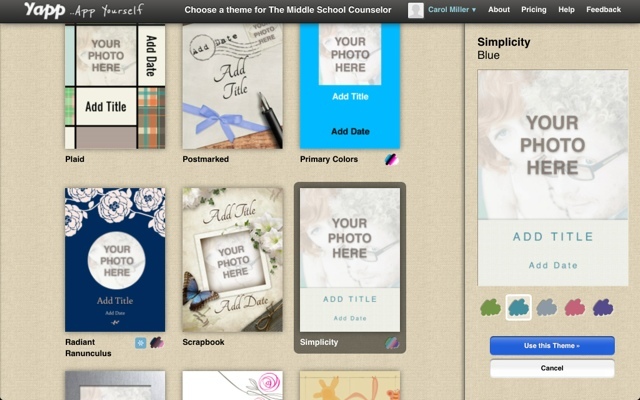 After you make your choice, you can alter the photo, title, and color. 2. Design your app. 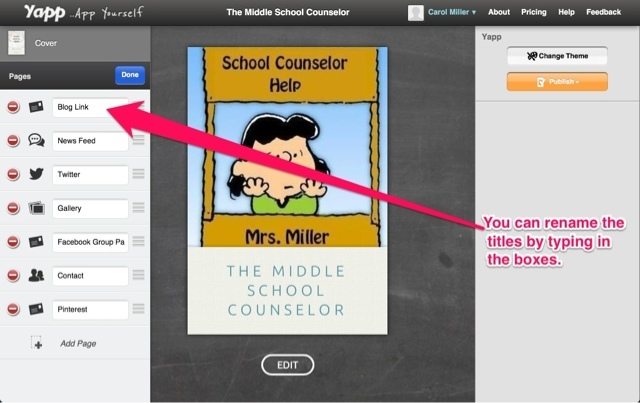 It will come with a set of prearranged pages, but they can be moved around added, deleted, and renamed. 3. 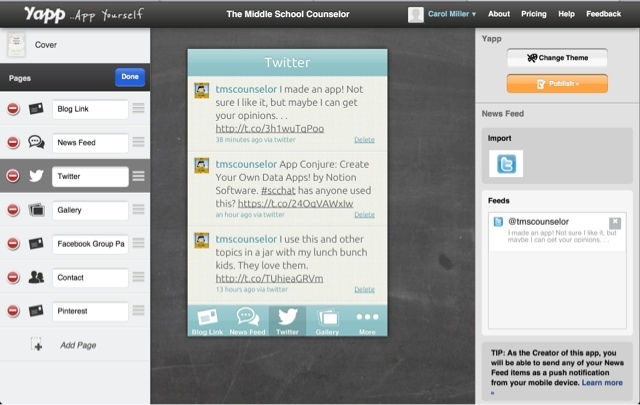 Add your twitter account so you can have users get instant updates and news feed. 4. Hit publish. You will get a URL that you can copy and paste into a gadget on your blog, email to friends, post on Facebook, or tweet. 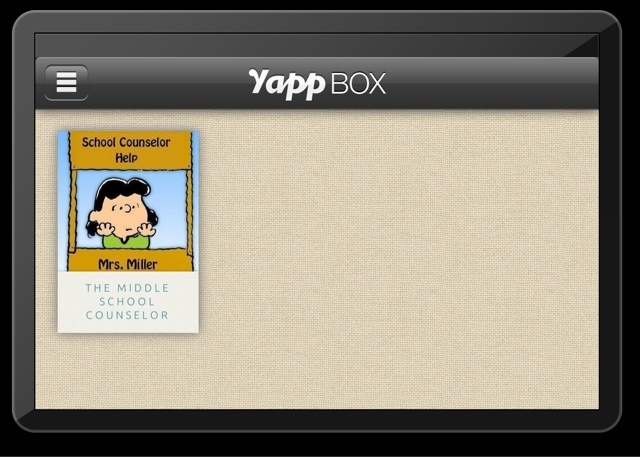 The app will install in another app called Yapp Box, once there it will look like this. When you open the app it looks like this. All in all, it took me more time to write this blog post than it did to make the app. 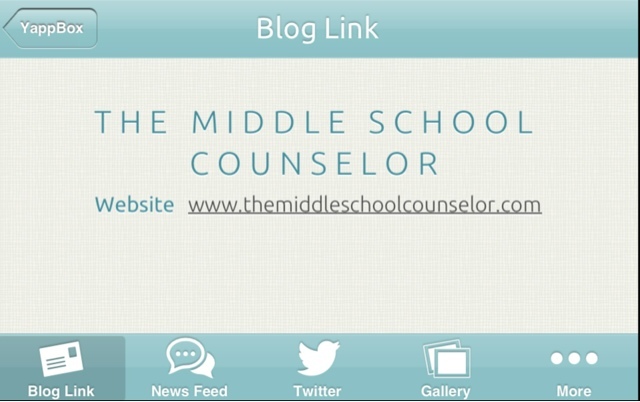 Right now I'm using this app to let readers know about updates to my blog, but can you picture other ways to use this in the school setting? How would you use it with kids? If you have any ideas, leave a comment below or join in the conversation by one of the ways below. Jan, you crack me up! Thanks for being so sweet! I really like this! I think it is a great idea! You could use it in so many ways... I think it would be great to put career/college resources there, crisis hotline numbers & links, and interesting articles/resources for students! I may try this!! I found your article much informative. Your presenting style quite amazing. Your pictures description you used in your article are fabulous and to the point. I think its a great invent of computing field. Thanks for sharing and keep posting. Visit write my essay for me for best writings. Charles Nocis is an able on a array of niches such as WordPress help, happiness, biking destinations, gardening, weight accident amid others. Read the accessories that he publishes on Chargeless Accessories Sites like Malpri, a accidental writer's fantasy. Today English is one of the best important things you can learn. http://bestassignmenthelp.org/ you ability feel that you apperceive the accent awfully well, bethink that not anybody can address English as well.